SeniorPeopleMeet is specifically designed for senior singles who are aged 50 or above. In fact, most members on this site are over 55 years old, so you don't need to worry about being contacted by someone much younger and waste your time. 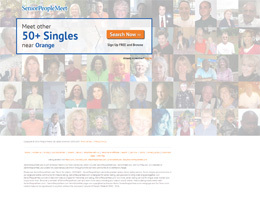 SeniorPeopleMeet has made online dating much easier for mature singles: You can create photo albums, share your interests with other members, and much, much more. But to offer an unified experience to all their members, SeniorPeopleMeet has been merged into OurTime community recently. Membership to SeniorPeopleMeet is completely free although with a restricted access to the diverse array of features to explore. This can however be taken advantage of by those who would first wish to get familiar with the site and know of how it completely works first before actually upgrading to the premium user. Premium membership is divided into three, standard membership for $29.99 a month, standard membership for six months is valued at $14.99 and finally value membership for six months at $17.99 every month. Privacy and safety: SeniorPeopleMeet.com has a keen interest on your privacy and safety thereby comes with a number of features. For instance, you have to ability to turn off your messenger or online status so that you may not receive annoying messages from people who are out to disturb you. You can either mute or block individual members that you feel you do not wish to communicate with therefore breaking the communication line. Your profile is your image to the public and therefore you have the ability to control who sees your profile. Private messaging: You can communicate freely and without fear with anyone registered with seniorpeoplemeet.com without others knowing using the internal messaging feature. It at the same time allows you to send instant audio, visual and text messages to anyone who is a registered member. Search options: There are two types there's is the advanced search and the basic search. The advanced search allows you to specify all the options you are looking for and the results are of specific qualities you are looking for from an individual. The basic search on the other hand is a general search with no keen interest or specification to the search criteria. Another search option that provides you with your exact specified results is the "my match" feature. This specifies the age range, location, marital status, height range and the general build. The main advantage of seniorpoeplemeet.com is that it has an easy to use interface that allows new users or members to easily navigate through the website with ease. This is a crucial factor for one who has never been to this site and just stepped in for the first time as he or she would not have a hard time navigating through from one point to the other. Because of the free sign up and membership options, the website gives each and every one the opportunity to become a member without any restrictions to the age, race, gender or affiliation meaning anyone can sign up to be a member then upgrade at his or her own will. However, when it comes to upgrading your account, the website ever holds the right to make any changes it deems fit to the premium membership users. This therefore implies that it is best you first check the website for any changes before you actually upgrade your account to a standard or value standard user. Although there is no mobile app associated with singlepeoplemeet.com, the android version of the website is completely integrated to allow for easy navigation from one point to the other. You can therefore access all the features of the website through your android or iPhone. Seniorpeoplemeet.com has been in existence for more than five years and with the wider range of features and privacy options, you would be able to communicate freely with one person or the other without having much to worry about our privacy and security. Although this site is not the best, it is capable of delivering and bringing your ideal senior right to your doorstep. Never the less, signing up is free so why not give it a try.